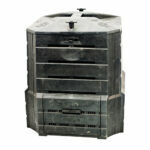 The world’s first continuous cycle compost bin. Organic waste is added at the top anytime, quality compost is taken form the bottom when needed! And gravity does all the hard work!! Independent trials have proven the Earthmaker processes kitchen and garden waste at twice the speed of traditional compost bins. Material aerates as it falls down the chambers decomposing rather than rotting, thus reducing the production of greenhouse gases. Heat draws air up through the material reducing smells, flies and greenhouse gases. Very little effort and just a few minutes each month is required to move the contents form chamber to chamber. 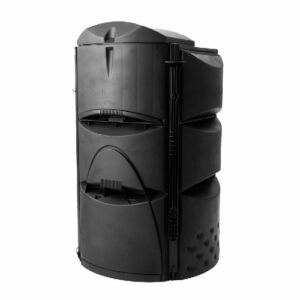 Lets break down the functions of this Earthmaker Composter. I’m sure if your like me you see all these selections of composters and wonder to yourself- Whats the difference between all these composters other they have different plastic molds, different colors, and different names.The Earthmaker Composter is very unique in that is has a three stage process of composting all designed to work within the one unit. Stage Two – After 3 to 5 weeks you slide out the panel to allow this section of compost into the second camber where it cools down a bit and allows for the second stage of the composting process- This also allows for adding fresh new material to compost back into the top chamber to get another batch of compost brewing. Stage Three- This is the last stage of the composting process- You simply remove the second panel and let the stage two compost slide into the 3rd chamber where it can really mature as compost. It also cools down to a normal temperature so that you can apply it to your lawn or garden without any damage. 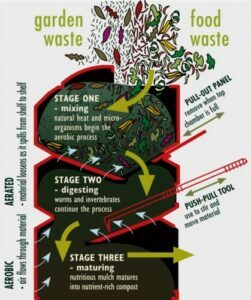 These stages all allow for the proper composting stages to take place independently of each other and gives you the opportunity to always have a batch of compost in the works! 16.4 cubic ft., 30L x 30W x 47H inches (466 liters, 75 x 75 x 120 cm). For busy people wanting an easy, green way to deal with organic waste. 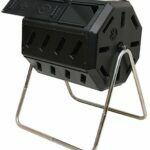 For gardeners who want an easy, fast way of making compost. 10 gallons of compost every month. 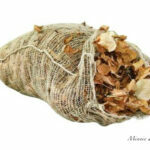 Keeps fresh waste and mature compost separate. Large openings for adding waste and removing compost. Delivered in a flat pack that clicks together easily. No tools or composting experience required to get started. Full assembly instructions and user guide in every box. 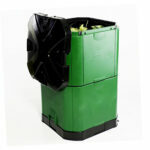 The world’s first continuous cycle compost bin.